(skating / treading / walking) on thin ice: 1. in a dangerous position where you could fall or have an unfavorable result; 2) in a risky or uncertain situation. If you walk, tread or skate on thin ice there is a good chance that you might fall through the ice and into the freezing cold water. It's a dangerous and risky position to be in and it is uncertain exactly when you might fall and what the result might be. 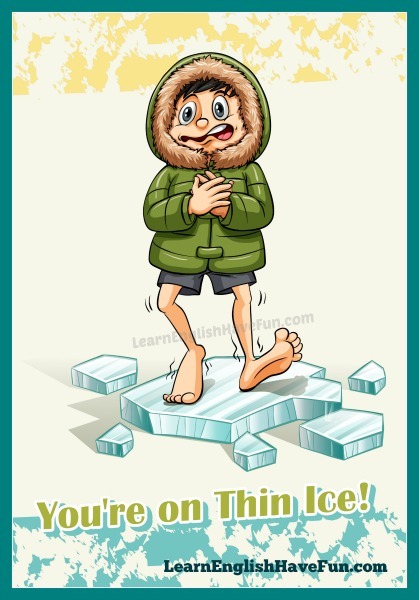 So literally, on thin ice means you are standing on ice that is too thin to support your weight (and you're most likely to fall through the ice). Idioms use figurative meanings of course—so on thin ice means being in a risky, dangerous or uncertain situation. Don't raise your voice to me young man! You're already skating on thin ice. If you keep charging things you can't afford on your credit cards you'll be treading on thin ice in a very short period of time. I'm on thin ice with my teacher because I haven't turned in my homework three times this week. You're on thin ice exaggerating your accomplishments on your application—they can check this information you know. I can't go with you to the mall this afternoon—I'm on thin ice with my boyfriend since I've spent so little time with him lately. We knew we were skating on thin ice when we brought fake IDs to try to get in the bar. I think I may be walking on thin ice with that accusation but I'm too angry to take it back. Don't you think you might be treading on thin ice by using the same research paper for another class? I'm really treading on thin ice here. The gas gauge is on empty but hopefully we can make it to a gas station before we run out of gas. I'm on thin ice again with my landlord—the rent was due five days ago and I've been ignoring his calls. If you keep arriving late to work, soon you’ll be skating on thin ice. Since I stopped studying on weekends I’ve been walking on thin ice. I’m always on thin ice with my mother-in-law and I have no idea why. If you found this idiom useful, sign-up for my free newsletter to learn about new updates to my website. I also provide notices about my contests and other helpful tips and information. Write a sample sentence (or two!) in the comments box below. It's great to practice writing your own sentences when you learn vocabulary and I'll also provide feedback.